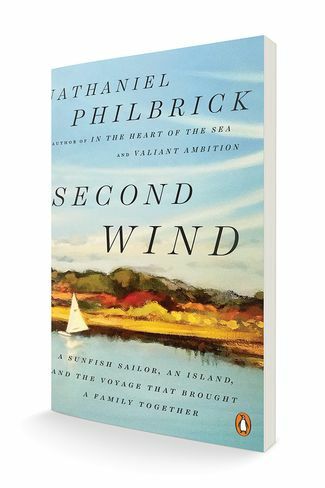 Excerpt from Second Wind, by Nathaniel Philbrick. 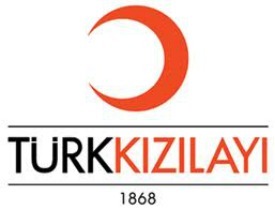 Published by arrangement with Penguin Books, an imprint of Penguin Random House LLC. Copyright (c) 2018 by Nathaniel Philbrick. On Friday, April 23, Bruce Perry, a friend who was the administrator of the Conservation Commission on Nantucket, called to tell me the town was opening Sesachacha Pond that day. All winter he’d heard me talking about my dream of one day sailing “through the cut.” As it turned out, we were scheduled to have dinner with Bruce and his family that night, and since he planned to watch the cut’s completion that afternoon, he said he’d tell me about it in the evening. Bruce and family lived in what’s called an upside-down house (bedrooms downstairs, living room and dining room upstairs) overlooking Long Pond in Madaket on the western end of the island. It was the perfect place to hear about a pond opening. Apparently, Sesachacha had been at a record high, so when the cut was finally completed, it had come roaring out in a way that dwarfed the relative trickle I had seen in October. Bruce recounted how fish and even eels were caught up in the rush of water that had quickly carved out an opening the size of a small river. If anything, it should be even bigger by the next afternoon when I planned to go sailing. That evening, during the drive back into town, I promised Melissa that I was more curious than I was determined to sail through the cut. I just wanted to take a look. And, to be truthful, Bruce’s words had a sobering effect. I wasn’t going to go dashing out there like the Lone Ranger. I didn’t want to wreck my boat or drown myself. I really didn’t. 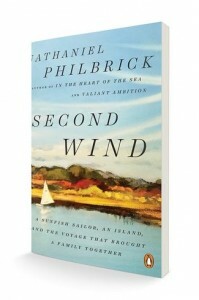 I spent Saturday morning in the Nantucket Atheneum, the town library. The building, particularly in the wing where the archives were stored, had a Miss Havisham feel to it, as though it were still suspended in a time that the world had long since passed by. Although a spectacular and much-needed renovation project has given the building a whole new ambiance, that morning in the spring of 1993, as I read my way through a stack of ancient letters, I felt as if I too were a kind of artifact blanketed with dust. By the time I set out for Sesachacha around 1 in the afternoon, I was anxious to wash off the past and rejoin the present. Melissa, the kids and Molly were in the car with me. The plan was this: They’d help me with the boat on the southern end of the pond, then drive over to the other side, where they’d walk the quarter mile or so to the cut. The subject of my sailing through the cut was studiously avoided. I was reserving judgment. Appearances, particularly when you’re looking at a distant beach, can be deceiving. The breeze was moderate out of the southwest with plenty of peppy puffs. Soon I was sailing on a beam reach toward where the cut, if there was one, should be. I passed a father and his son fishing in a motorboat. As I entered the midsection of the pond, I saw that Melissa, the kids and Molly had parked and were now walking along the pond’s edge toward the ocean. I waved, but they were too far away to notice. It was then I realized that there was a cut. It was wider than I would ever have imagined — maybe 30 to 50 feet. A virtual torrent of water was rushing through the opening, a white-water river that must have been close to an eighth of a mile long as it curved out toward the sea and collided with the ocean’s surf in a distant intermingling of brown and blue waters. I now knew what Bruce had meant when he had spoken of the pond’s power, a power that showed no signs of waning more than 24 hours after it had first been tapped. Someone was standing on the northern edge of the pond cut. After watching me for a while, he waved and called out to me. It was Bruce. The question was how to get close enough to speak to him without being immediately sucked out to sea. I approached cautiously from the north, where a sandbar had been formed by the turbulence at the cut’s opening. I decided to sail past the pond opening just to give it a look. Although I could feel the current grab my boat, torquing it seaward with a trembling, atavistic lurch, the cut wasn’t the all-consuming portal to destruction that I had first assumed it would be. There was enough of a breeze to let me flirt along the opening’s edge without losing myself to the current. The cut was wide. There was plenty of space for me to sail through it, even with my sail all the way out. It also looked fairly deep. I did notice, however, quite a bit of wave action at the end of the cut. In fact, it looked like a sandbar had formed out there. Even if I did make it through the cut alive, how in God’s name was I ever going to sail back to the pond? But still, the opening beckoned. Suddenly I was filled with a desire to just close my eyes and ­surrender myself to the flow. Meanwhile, Melissa and company were gradually making their way along the beach. Should I wait for them? If I did, I might lose my nerve. I tacked and began to bear away toward the cut.